Know what my favourite thing ever is? Doing things twice. Even better if I’m redoing them because I did something stupid the first time, and that’s exactly what happened with this Caramel Apple Cake. I had to bake the damn cake layers twice because when I thought they were done, they actually weren’t even close to done, but I took them out anyhow and they completely deflated and caved in. UGH. I hate wasting things — time, ingredients (aka money), food, etc. So I trimmed the failed cake layers to even them out and stuck them in the freezer to be used for I don’t know what, I don’t know when. I have issues throwing stuff out until the fridge/freezer situation gets so dire that I go in there to do a massive clean out and throw out anything I deem past its prime. I don’t like to get to that point though. My second attempt at the cake layers went much better (I did tweak the recipe a tad though too), except that I overbaked them for fear of underbaking (lol). Overbaked is better though — you can always save a drier cake with some simple syrup, but you can’t serve people raw cake! I’ve actually had a lot of troubles lately with premature cake removal, so I’ve decided to stop relying on skewers/cake testers to test if the cake layers are done. Often times I’ll poke a skewer in there too early and the cake layer will collapse a bit. It’s soul crushing. Sometimes the skewer will come out clean, but they aren’t actually done! Now, my first test will be to gently press the tops of the cake layers with my finger. If they spring back, they’re done. If it leaves a bit of an indent, they’re not. 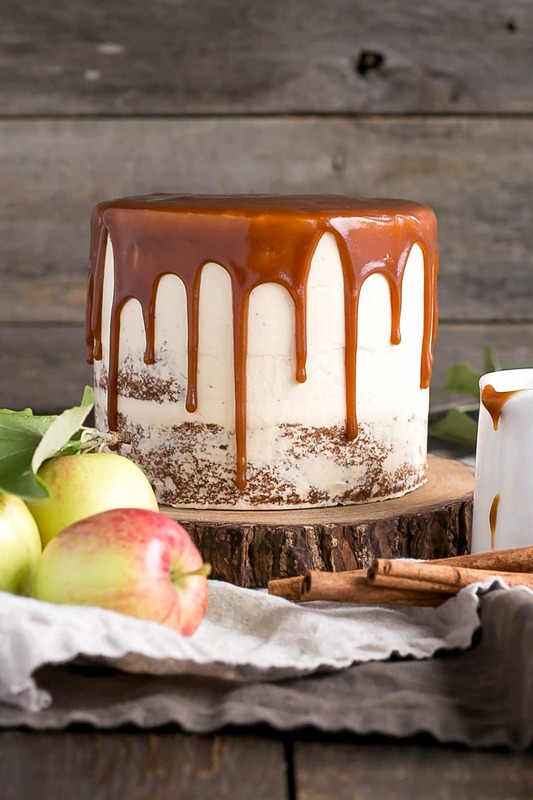 Ok, let’s talk about this Caramel Apple Cake because it is the perfect cake for Fall. Especially early Fall, where we are now. It’s the start of apple season! We’re lucky to have a lot of amazing local apples grown in the BC interior. I haven’t seen a lot of them at the markets yet, but they should be popping up soon. My very favourite apples are Honeycrisp. They are crisp, juicy, and the perfect mix of sweet/tart. Actually, if I’m being honest here, my absolute fave are Macintosh, but they’re not the best for baking (too soft). I actually can’t remember what kind of apples I used for this cake. It wasn’t Honeycrisp, because I couldn’t find any, and it wasn’t Granny Smith. Really though, you could use almost any kind of apple you like for this Caramel Apple Cake. I chose to chop the apples into small chunks to get more of that flavour/texture, but you could also grate them if you like. The perfect and pretty apples in the pictures are from my friend Sam at My Kitchen Love. She graciously offered to give me the last 3 apples from her apple tree so I would have some rustic apples for my photos. I’m not kidding when I tell you I had 10 perfectly fine store-bought apples sitting on my counter ready to be used, but instead I chose to drive 1 hour round trip in the pouring rain on the morning that I was meant to shoot this cake just to get these 3 precious apples. Totally worth it. By the way, you must check out Sam’s blog, her recipes are both stunning and delicious! The caramel recipe that I used for this Caramel Apple Cake is my absolute favourite. There are easier ways to make a caramel, sure, but this one isn’t that hard and it’s totally worth it for a smooth, silky texture. I used this same recipe in my Turtles Cake. It’s truly delicious! 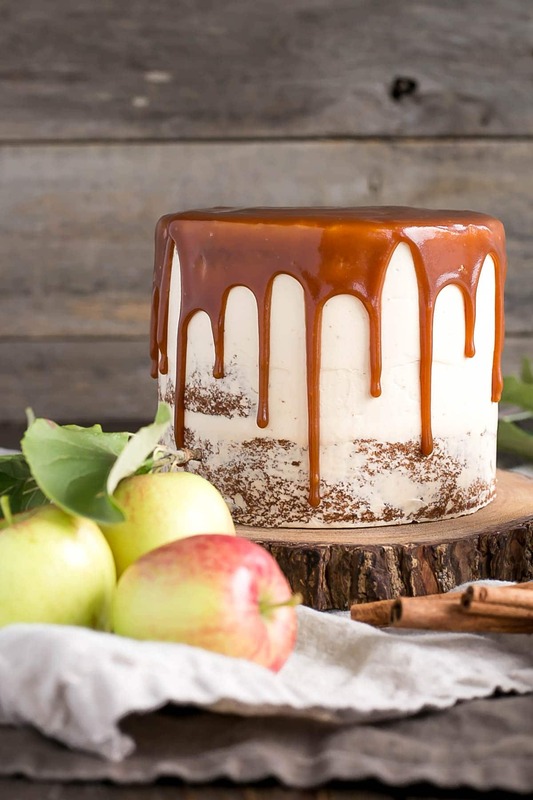 A simple Swiss meringue buttercream with caramel added into it is the perfect compliment to this Caramel Apple Cake. The flavours go so well together. If you’d like an additional hit of caramel, you can drizzle some onto the buttercream on each layer. You’ll have enough to do that if you like. 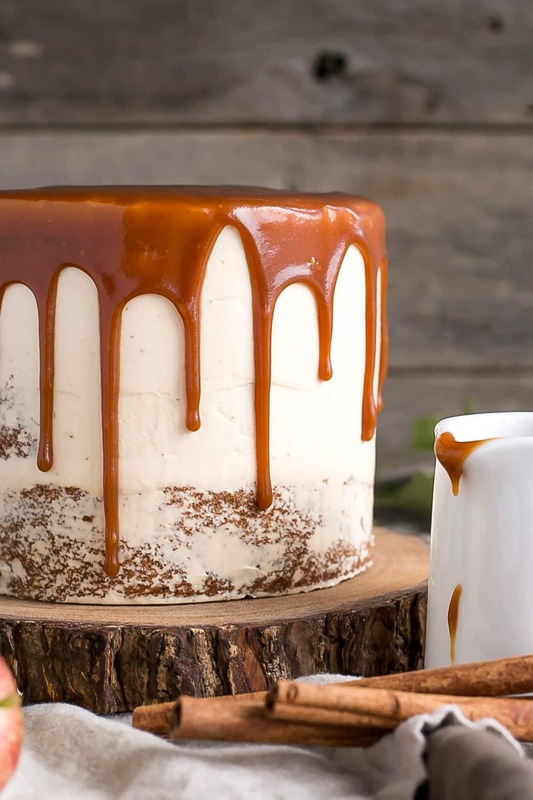 I kept the decorating simple — a naked cake with a caramel drip. 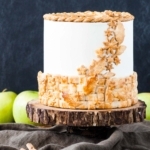 This is the perfect cake for Fall, and a great way to make use of all of those amazing apples! You can use any apples you like for this cake recipe. The caramel will keep for a good month or so in the fridge, so you can make this in advance. If caramel has thickened too much, microwave in 5-10 second intervals until it’s pourable (but not warm). 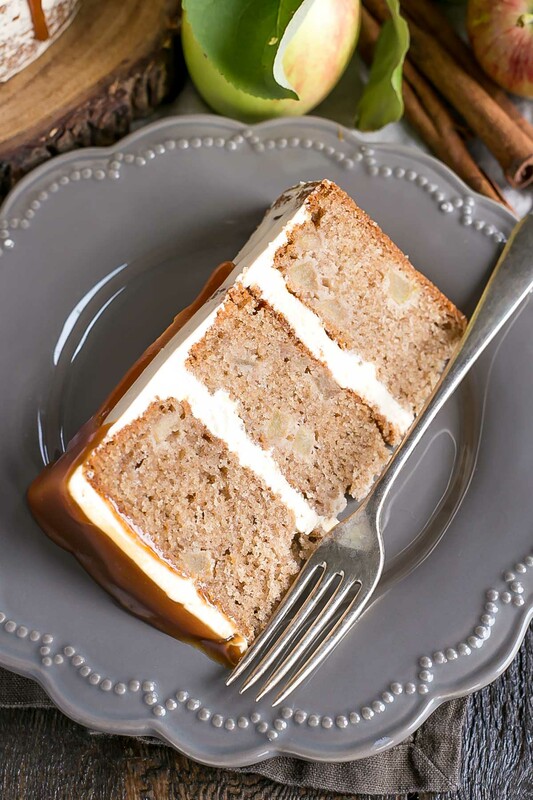 If you like this, check out my other Fall themed recipes: Apple Pie Cake, Pumpkin Spice Latte Cake, Spice Cake, Pumpkin Spice Bundt, Pear & Walnut Cake. Toss peeled & diced apples in 1 Tbsp light brown sugar and 1 tsp cinnamon. Set aside. In a medium bowl, combine flour, baking powder, spices, and salt. Set aside. In the bowl of a stand mixer combine vegetable oil and sugars. Beat until well combined (2 mins). Add eggs one at a time, fully incorporating after each addition. Add vanilla. Add flour mixture in 3 parts. Fold in apples. Spread batter evenly into prepared pans and bake for 45-50 mins or until a toothpick inserted into the center comes out mostly clean. Cook until desired color of caramel is reached (amber) and immediately remove from heat. Very slowly pour in heavy cream while whisking quickly. The mixture will bubble up (a lot) and boil. Add butter, return to heat, and bring back to a boil. Cook for 2 minutes whisking constantly. Place bowl over a hot water bath on the stove and whisk constantly until the mixture reads 160F on a candy thermometer and is no longer grainy to the touch (approx. 3mins). Place bowl on your stand mixer and whip on med-high until the meringue is stiff and cooled (the bowl is no longer warm to the touch (approx. 5-10mins)). Trim cake layers if needed. Place one layer of cake on a cake stand or serving plate. Top with 2/3 cup of frosting, spread evenly. Repeat with remaining layers. Frost and smooth the outside with a thin crumb coat. Chill for 20mins. * The caramel can be made the day before and left in the fridge overnight. ** Ensure there is NO trace of egg yolks in your whites and that your mixer bowl and whisk is completely grease free or your meringue won't stiffen. *** The buttercream may look like it's curdled at some point. Keep mixing until it is completely smooth. **** If caramel has thickened too much, microwave in 5-10 second intervals until it's pourable (but not warm). Hi Vivian! The cake batter is more on the thicker side but should still be pourable and spreadable. I only made the caramel glaze but it wasn’t fantastic! Hi Olivia, can I used salted butter for the caramel? Hi Christa! If you want more of a salted caramel then for sure! Hi Olivia, I’m wondering how much I need to increase the recipe by if I need 2 x 10 inch cakes from this? Double or triple? Also, how long should I bake it in the oven for if I’m baking 10 inch cakes? Thanks! Hi Alice! Converting pan sizes is always tricky. 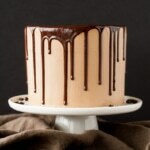 Here’s a site I use as a guideline: http://www.joyofbaking.com/PanSizes.html I would say 2x the recipe would be safe. Baking time would be somewhat similar, but I always recommend checking them multiple times throughout the baking process. 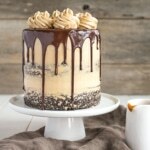 I made the Caramel and the Caramel Swiss Meringue Buttercream from this recipe and both were *phenomenal*! I had zero issues with either recipe – they came together great! For the Caramel, I made it the day before and put it in a lidded Mason jar and left it out on the counter overnight. In the morning, it was such an amazing, spreadable, and luscious consistency that I could not stop eating! The Caramel recipe itself made a little over 1 cup total. Yay! LOVE that caramel recipe, so am glad that you do too. And thanks for the tip about not refrigerating overnight — I’ll have to give that a try. I made this cake over the weekend as a trial run for my father in law’s 70th next weekend. It’s absolutely delicious! The only thing is the butter separated from the caramel and sat on top. I tried mixing it in and poured it off in the end, but the consistency of the caramel wasn’t right for drizzling – more gloopy. Any idea where I went wrong? I made it the day before and tried to get it back to a pourable consistency. Hi Mel! Hmm, that is strange! At what point did it separate? Did you refrigerate it? It sounds like maybe it wasn’t fully incorporated into the caramel. It will thicken up quite a bit in the fridge but should not go solid. It should be thick and lava-like consistency from the fridge. How did you try to warm it up? I usually heat mine slowly int he microwave. I wonder if it was overcooked after the butter and cream was added and became more of a fudge? 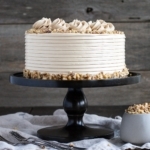 I know you only iced it like a naked cake, but will this frosting recipe fully frost the cake or is it only enough to do it naked style? Hi Kasha! There won’t be too much frosting left over so I would either 1.5x or 2x the frosting recipe. I’m making this cake tonight for a party on Sunday. Will the apples be ok if I freeze the layers? Hi Amy! Yes, they will be fine. I froze them too. I’m making this cake for a party at the weekend. Can I make the Swiss Meringue frosting in advance or does it need to be put on the cake straight away? Or could I just make regular buttercream frosting and add a little caramel sauce to it? Thanks. It looks amazing so I hope I don’t justice. Hi Jacqui! The frosting can be made in advance and refrigerated. Just bring it to room temp and rewhip before use! You could also make regular frosting too though 🙂 I hope you like it! Hi Alana! It should double just fine! Should I double or triple ingredients for 3 9″ rounds? I was thinking to triple it but want to be sure! Hi Lee! The recipe also works for two 8″ pans. Hi Izzy! Thanks so much for the great feedback. I’m so glad you liked it! Can this cake once made be out in the freezer . Hi Heidi! It should be fine at room temperature for a day or two, depending on how hot your place is. I tend to refrigerate my cakes after the first day though. When you say 1tsp of vanilla do you mean vanilla extract? Olivia, your caramel drip is the MOST perfect I’ve ever seen!! Tell me, do you manage to make it stop dripping at some point? Mine keep forever dripping down, no matter how cold. Is there a secret? Thank you!! Caramel is SO hard to work with, especially for a drip. In all of my other cakes with caramel drip, it goes right to the bottom. I think this one was a thicker caramel and I refrigerated it over night and then warmed it only a bit the next day. It really just depends on the consistency when you do the drips. It also helps to have a cold cake out of the fridge! Your cakes look amazing and I’m excited to try this one! I haven’t finished putting it together yet, but when I took my cakes out of the oven and flipped them out to cool, the middles sunk in. This happens to me all the time!! Do you have any tips for that?? Hi Jenny! Ugh, that happens to me sometimes when I take the cakes out too soon and they’re not quite done cooking. As soon as you take them out they will start to sink and cave in because the structure isn’t quite set yet. How do you test to make sure they’re done before taking them out? This looks so delicious – can’t wait to try it out! 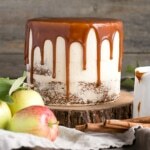 Is it ok to place the cake in the fridge after putting the caramel drip on? My concern is that the caramel may lose its gorgeous glossy shine if I do. Hi Victoria! It will lose it’s shine a bit, yeah. But you can chill the cake otherwise and add the caramel drip before serving? Olivia, this is exactly what I’ve been looking for as Luggage been asked to make something for a friend. My question is what was the reason for choosing the frosting of meringue buttercream vs american buttercream. I’m very nervous about the icing! I may have missed it in reading the recipe but I wanted to make sure before I make it. There is the homemade caramel and then there is caramel in the frosting. Is the homemade caramel what is used in the frosting? Then the rest of the homemade caramel is used to drizzle over the top? Your cakes are so amazing!! I especially love the caramel buttercream on this one!! Looks wonderful! 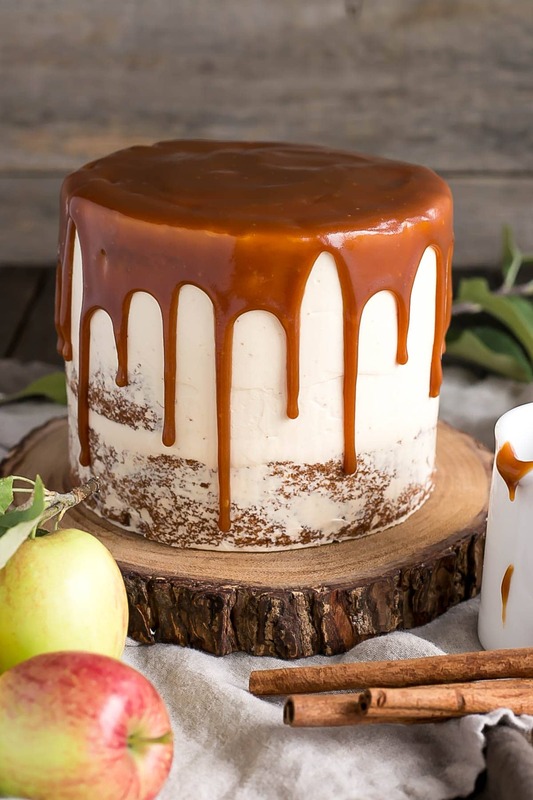 How far in advance can you decorate the cake with the caramel? Will it hold its drips or does it need to be poured on soon before serving? 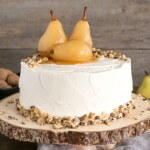 This cake looks absolutely amazing, and I’m planning on making it for Thanksgiving this weekend! Just wondering how “spiced” the cake is. Would you consider adding some cloves or allspice to bring out the “spice” in the cake? Or do you find it’s a good balance of apple and spice? 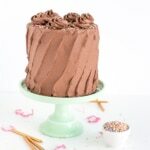 I’ve also never made a Meringue Buttercream, and am a bit concerned with the difficulty..! But I have to give this cake a try!! Thank you so much for your tips!! I made this cake this past weekend, and it was a HUGE hit! So many compliments! I am definitely going to make another one of your cakes again. They are beautiful, and so delicious! You directions are so clear, and I was able to make caramel and meringue for the first time! I added a little bit of allspice, and cloves as well, but not much. Thank you so much for responding to my message so quickly, and for the extra tips, it helped so much! 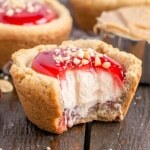 Definitely an amazing recipe, and blog!! Yay!! I am so happy to hear that it worked out for you! Seriously great job for nailing the caramel and meringue buttercream on the first try. And thank you for the feedback 🙂 I’m glad to know that my recipes and instructions are clear! im making this for a friend today! Girl, you are preaching to the choice. Baking is tough! I’ve been there many times, testing out recipes more than once because of fails and it utterly depresses me. Shall we start a support group? Ha. Love this recipe – it is the epitome of fall and so up my alley. Divine! Oven-spring is my first testing method, with a toothpick or tester as backup. Cakes and over can be so sensitive!! And we are serious fans of cake scraps in my house – they don’t last long in my freezer! Crumbled over ice cream, cubed and used for a trifle (bonus – it uses any leftover frosting/fillings!) or just nibbled at random snacky moments… Lol. 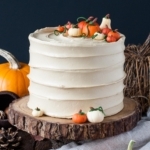 Anyway, this cake is beautiful and I bet it tastes like a delicious slice of Fall! !